Exhibiting at the National Lifelong Learning Festival "Manabipia Fukushima 2008"
The Konica Minolta Group set up its portable planetarium system at the 20th National Lifelong Learning Festival "Manabipia Fukushima 2008," held from Saturday, October 11 to Wednesday, October 15, 2008. This provided an opportunity for people of all ages, especially children who represent the next generation, to deepen their interest in space and astronomy. With the theme of developing a love for learning and inspiring future dreams, Manabipia Fukushima 2008 was held at the Big Palette Fukushima in Koriyama, Fukushima, as the principal site. 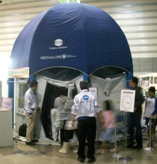 Every year Konica Minolta exhibits its compact, portable Mediaglobe digital planetarium system, and it always receives a favorable reaction from children and families. About 3,000 people visited the Konica Minolta booth to enjoy the planetarium and deepen their interest in space and astronomy. Sponsored by the Ministry of Education, Culture, Sports, Science and Technology and the host prefecture, the National Lifelong Learning Festival (popularly called "Manabipia") is held every year with the aim of promoting lifelong learning among all the people of Japan. Leveraging the energies of private companies and public bodies, organizations and individuals, the festival serves as a venue for various events related to lifelong learning, and as a place to present learning results. The festival seeks to increase public interest in lifelong learning and encourage participation in learning activities. With the idea of using a planetarium to encourage lifelong acquisition of knowledge concerning the stars and science, Konica Minolta has been continually exhibiting at the festival since it first participated in the 13th festival in Yamagata, in 2001. Mediaglobe II Mediaglobe is a full-sky digital planetarium that can be easily transported. It uses digital technology to project realistic images onto the full surface of a dome. 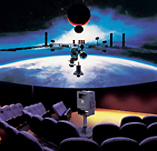 Konica Minolta began selling the compact Mediaglobe digital planetarium system in 2001. By projecting galaxies and other celestial bodies as three-dimensional models, the Mediaglobe II, launched in 2007, not only shows the night sky as seen from the Earth, but also recreates space trips to nearby planets and moons, as well as interstellar voyages that go beyond our solar system. More than just reproducing the night sky, Konica Minolta is supporting the popularization of astronomy, by providing various computer-graphic programs relating to space through the use of digital projection technology.